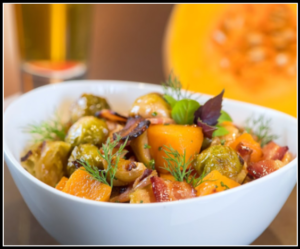 Image of Roasted Butternut Squash and Brussels Sprouts with Applewood Smoked Bacon taken for the Beer Institute. Recipe was created by Chef Laurent Aubel. In a large bowl combine butternut squash, bacon, and Brussels sprouts. In a smaller bowl, combine olive oil, garlic, shallots, agave, sherry vinegar, and beer. Pour liquid over vegetables and toss until they are covered. Season with salt and black pepper and then spread vegetables evenly on a baking sheet or roasting pan. Roast in preheated oven for 25-30 minutes, stirring every 10 minutes, or until vegetables are tender and lightly browned.